For two great decades Mike Gatting, with his big beard and proud strutting gait, was a real and regular force within the English professional cricket team. Mike was a fine stroke player with plenty of power, often smashing the ball though extra cover — his favoured shot — for both club and country. He was also a great man to have in when facing spin and would often scare the spin bowlers away with his no fear playing approach. Despite his unlikely appearance, Mike was a natural choice to play for England and his oak-tree like forearms are part of the reason why. A real point scorer who first joined up with England on tour as just a twenty year old in 1977-78, he didn’t hit his first century for a further 54 matches. Until that came he played in every position in the batting line up and finally knocked a great 136 in India, showing real guts and skill to battle hard through a tough innings. The press watching were won over and a true star was born. Mike went on to become captain of his side a year later and eventually was awarded an OBE for his services to cricket. He went on to win the Ashes but eventually lost his place in the side after a set to with a referee. 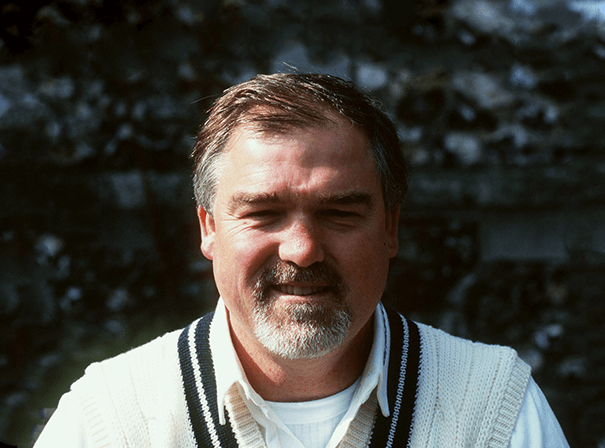 Nevertheless, Mike Gatting will forever remain one of the greats of the English game thanks to his ability with the bat and dedication to the cause.